Home / Remembering George Blackburn, M.D., Ph.D.
Remembering George Blackburn, M.D., Ph.D.
Dr. George Blackburn and Cynthia Stamper Graff, Lindora Director and author of The New Lean for Life, at Treating Obesity 2016: The Blackburn Course in Obesity Medicine, Harvard Medical School. Lindora Clinic celebrates the life and legacy of longtime Lindora Advisory Board member George Blackburn, M.D., Ph.D., who passed away February 20. A visionary and innovator in the fields of bariatric (weight loss) and nutrition medicine, Dr. Blackburn was a dedicated professor, renowned clinician and surgeon, prolific researcher and author, tireless public health advocate, enthusiastic mentor and longtime advocate and friend of Lindora Clinic. 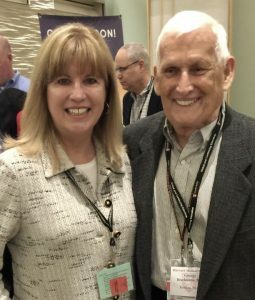 Over the years, his wisdom and generous counsel was invaluable in the growth and evolution of our Lean for Life program. For decades, Dr. Blackburn was on the cutting edge of pioneering best practices in both surgical and nonsurgical interventions for the treatment of obesity and obesity-related diseases. The lessons and insights shared at the annual Blackburn Course in Obesity Medicine at Harvard Medical School inspired many of the lifestyle strategies that are integral to our program. He was a force of nature whose keen intellect, quick wit and easy smile were gifts to those fortunate to have known and worked with him. Dr. Blackburn was Professor of Surgery and Nutrition, Associate Director of the Division of Nutrition, and first incumbent of the S. Daniel Abraham chair in Nutrition Medicine at Harvard Medical School, and was the Director of the Center for the Study of Nutrition Medicine in the Department of Surgery at Beth Israel Deaconess Medical Center in Boston. A past president of the Obesity Society (formerly NAASO) and the American Board of Nutrition, he was on the editorial boards of the Journal of the American Medical Association and the New England Journal of Medicine. We honor his extraordinary life and his enduring legacy.